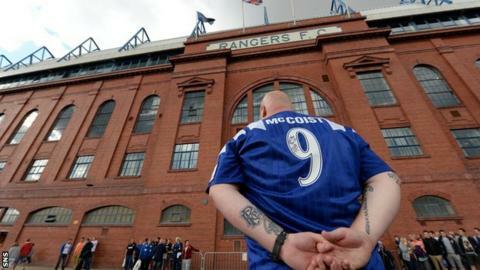 Rangers fans are awaiting news on the uptake of a share issue by the Rangers International Football Club plc. The open offer of almost 20 million new shares to existing shareholders opened at the end of August. At the time, Rangers stated that a failure to attract buyers for at least 15 million shares would result in the company struggling to pay bills. On Friday morning, Newcastle United owner Mike Ashley ruled out purchasing any shares. Ashley, a current shareholder in the company, had been mooted as an underwriter for the entire issue but said in a statement to the London Stock Exchange: "I will not be participating in the open offer, which closes at 11am today, Friday, 12 September, 2014." Reports had circulated that Ashley could be looking to buy Rangers, but it has been confirmed he will not consider selling Newcastle until the end of next season at the earliest. The company previously told the Stock Exchange that it hoped the funding would help "re-build and re-establish Rangers as a stable, sustainable and successful business". A previous attempt to raise £10m from city investors proved unsuccessful. Rangers insist even more funding will need to be raised "in order to meet working capital requirements". Overall, the club is looking to raise between £20m and £30m over the next three years and will consider "lines of credit, other forms of short-term finance or...a component of a further equity raise". "Failure to secure such funding would be damaging to the business and may impair the value of the ordinary shares," the club explained. The open offer is not underwritten and, if the level of subscription is less than 15 million new ordinary shares, the open offer will not proceed and subscription funds will be returned to applicants. The share offer statement also said: "Should this occur, the company will be unable to pay its creditors as they fall due and the future of the company will be uncertain. "The directors will immediately have to seek emergency financing, which may or may not be available."